Jimi Hendrix routinely is listed at number one on the list of greatest rock guitarists. While some may debate his being placed on the top spot, few would argue he was not among the most influential and revolutionary guitarists of all time. Such an achievement is made even more impressive when you consider he developed his amazing level of skill while still in his 20’s. Jimi Hendrix was born on November 27th, 1942 in Seattle, WA. His father served in the army and was stationed in locations far from his son. For the first three years of his life, Jimi was raised by his mother and relatives until his father could return to Seattle after being discharged from the army. His parents did not have a lot of money and the family moved around quite a bit. At the age of nine, Jimi saw his parents get divorced and this would have a traumatic effect on him. As a young child, Jimi would develop an affinity for the guitar, but his father was not willing to buy him one. Jimi would go around carrying a broom pretending it was a guitar. In a strange stroke of luck, he would find a ukulele in the garbage. This became the first instrument he would play. He learned how to play the instrument, which only had one string, by ear. At age 15, he would buy his first guitar for $5. He became wildly passionate about playing the guitar and, basically, taught himself playing by ear. He launched a band called the Velvetones and continued to play his acoustic guitar. His father eventually bought Jimi an electric guitar as a gift. Jimi would leave home and go into military service for a time. He played the guitar recreationally when he was in the military. In 1963, Hendrix would start playing in clubs. His skill level ended up catching the eye of those in the music industry. He ended up being booked to go on tour through the south. He was mainly playing blues with a rock flavor. He would go on to tour with the Isley Brothers in their backup band and would work with Little Richard. His success was mixed though. No one would ever say Hendrix was not talented, but the various bands he formed were not successful. 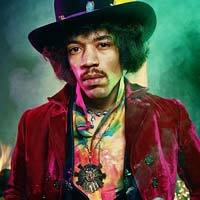 In 1966, he would create a new band called The Jimi Hendrix Experience with Mitch Mitchell and Noel Redding. The band was a hit thanks to their amazing stage performance and Hendrix’s over the top style. The first album by the band, “Are You Experienced?” forever changed the way musicians looked at how the guitar can be played. Hendrix was now enjoying worldwide fame and his appearance in 1967 at Woodstock and, later, the Monterrey Pop Festival would further establish his legendary status. Two more albums followed, “Electric Ladyland” and “Band of Gypsies.” Jimi was on top of the world. Sadly, like his contemporaries, Hendrix was into the drug culture and a frequent partier. On September 17th, 1970, Hendrix died choking on his own vomit after taking a lethal mix of barbiturates and alcohol.